Get out your Gucci and prepare for a fashion-forward homecoming this year at Timber Creek. Starting on the week of Oct. 7, nominations for Homecoming Court will be taken. Voting for the court will occur the following week, starting on Oct. 14. 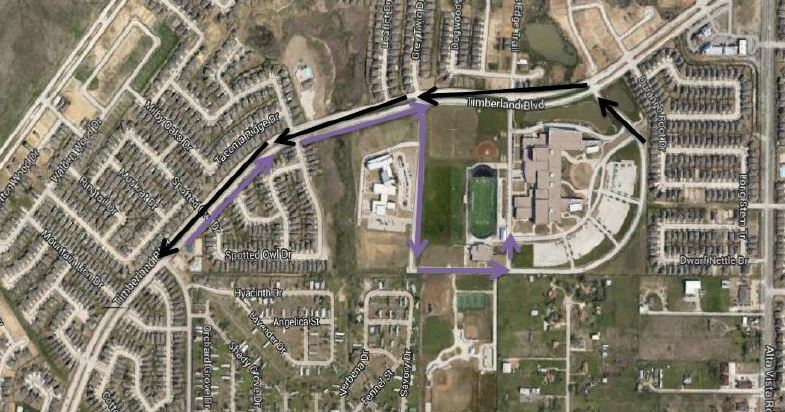 Homecoming Parade will begin at 6 p.m. on Monday, Oct. 20, and will depart from the Timber Creek campus. Parade participants, including students and floats from various organizations, are asked to line up between 4:15 and 5:15 p.m.
See below for the parade route. Traffic around the school will be impacted by the parade. Immediately following the parade a community pep rally will be held at the Timber Creek football field. The pep rally is current scheduled from 6 to 7 p.m.
To sign up for a spot in the parade, click here. On Friday, Oct. 24, Timber Creek students will attend a pep rally during 9th Period. Then, starting at 7 p.m., the Falcons will take on Northwest High School during the Homecoming Game at KISD Stadium. The homecoming king and queen will be presented during the game. Finally, on Saturday, Oct. 25, TCHS will host the homecoming dance at 8 p.m. in the Cafeteria. The theme for the dance is “Rock the Red Carpet.” Underclassmen homecoming court will be announced during the dance. For more Homecoming Dance information, click here.